To improve SEO rankings, it is important to not only write content that the readers like, but also that which is loved by the search engines. While the quality of content is important, to improve ranking, one needs to focus, additionally, one such factors as keyword research. 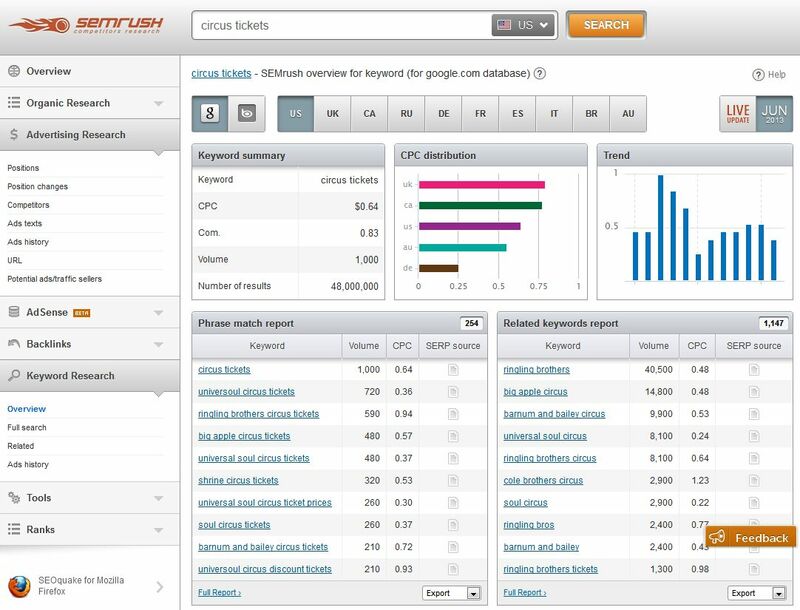 One of the most useful keyword research tools around is SEMrush. With this tool, keyword research is much easier, and one can therefore add them and track their progress on all the major search engines, based on one’s geographical location. A product of the developers of the popular Firefox add-on SEOQuake, it has more than 46 million domains and hundreds of millions of keywords in its database. With this tool, one can be able to find keywords which any page on the internet is ranking for. In addition, one can also find more statistical details regarding that keyword and other related ones for which they may want to rank. The trend of the traffic generated by the keyword; whether it is steady, rising or dying down. It allows for comprehensive keyword research. It has an SERP column that allows the user to see the actual webpage as they type in the keyword. There is also the useful section of the related terms. Here, one not only sees phrase matches but also related terms they had initially not thought about. Many do not consider a search engine marketing tool complete without the addition of a competitor research function. With SEMrush, competitor research is simplified, and one can easily compare themselves with what the rest of the market is doing. The competitor analysis tool shows the keywords that bring users to the site, as well as what other competing keywords could have done for the site had they been paid for. SEMrush also offers site audit, which is part of the tools section. Through the site audit, one can be able to discern the traffic specifics, including the peaks and the lows, as well as whether the site has been hit by a penalty. This is one of the most unique tools in the online marketing industry, and not many tools can claim to have it. 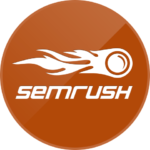 SEMrush also offers extensive backlink analysis. SEMrush displays the nofollow and the follow links in a pie chart design, and uses TLD to record domains. Another important tool that SEMrush has is the domain vs. domain tool. Which allows users to do a direct comparison between them and their competitors. It shows the number of keywords the sites compete against, as well as useful Venn diagram below that. This is a stand out feature in this tool and it is very practical for internet marketers who are conscious about their competition. With this feature, a user can be able to target the keywords being used by competition in a specific geographical area from the search engines. This allows a user to learn of the keywords that are making an impact and the orientation of the keywords that they can adopt that will counter the same to ensure the marketing campaign they employ is successful. This feature counters competition while maximizing traffic and sales for a user. This aspect is advantageous since it allows a user to have the capacity to categorize data according to the keywords that have been fed to the tool. This gives all the parameters that a user can work around to improve the effect of the keyword and also change the orientation of the same to improve the overall impact. This tool gives users the ability to build competitive keyword tables which can work effectively in giving further insight as to the effectiveness of a keyword. In building a competitive keyword table, a user is also given the power to identify the keyword and the phrases that they can effectively target to increase traffic and impact the target market to increase sales. SEMrush offers users the chance to perform competitor research and hence establish the keyword and phrases that are profitable. This is very important as it serves to create an operational module where a user will be steps ahead in managing the keyword orientation that will be unique and produce the desired results in terms of the traffic to be generated to a site or particular product. The phrase match tool is effective in ensuring that a user is able to match phrases to find the keywords that individuals and potential leads are bound to use. For internet marketers, this is equivalent to striking gold since it will give a directive as to the pathway of operation that should be exploited in the marketing campaign. With SEMrush, a user can be able to add a keyword of their choice and track the effectiveness and potential of profitability that it can bring. This is a handy tool since it gives the power of monitoring to a user thereby ensuring that a user does not suffer the agony of tracing third party tools to handle the same process. This is one other advantage that users must make use of and this is because the backlinks analysis feature enables a user to identify the backlinks that are working to drive traffic and those that are not effective in handling the same process with ease or the desired effectiveness. This tool with all its advantages lacks the appropriate and in depth tracking and marketing campaign management features. This makes it lack the appropriate bite that can ensure a user is able to perfectly manage an ecommerce campaign exclusively without having to outsource some services.